Great gift idea for Twilight fans! 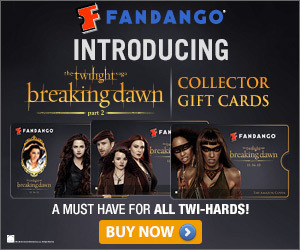 Fandango is featuring Limited Edition Twilight Breaking Dawn Gift Cards. You can even upload a photo to customize them yourself. Have them mailed or emailed depending upon how fast you need them. Denominations are available from $15 to $100, so they would even make great stocking stuffers. The recipient can then use the gift cards to purchase movie tickets for any movie and theater available on Fandango. Choose from 10 different card designs. No matter who your favorite Twilight characters are, you will find the perfect card. Visit Fandango for more information.